An older, broken-down Max Payne looks worse than ever. Rockstar revealed in April that it was teaming up with Marvel to produce a three-issue Max Payne mini-series, co-written by Rockstar co-founder Dan Houser and Sam Lake of Remedy, the man who originally created the character. The series promised to look at some of the events that took place in the background of the first two Max Payne games, as well as his formative childhood years, which as it turns out wasn't the most pleasant time imaginable. There were a few bright spots but a lot of darkness, and like so many of the bad things in Max's life, it started with the death of a woman. The art is solid if not exactly inspired, although the cover is brilliant, and the brief insertion of "classic Max" from the first game is a nice touch. But it's almost too bleak; the original game portrayed Max as an essentially normal guy who caught the ultimate bad break when his wife and infant daughter were murdered, but in the comic he comes across as someone who's pretty much doomed from the moment he came into the world. Max has had a tough row, but I think I prefer him as a man struggling to recover from a senseless, soul-breaking moment of horror than as a guy who's just flat-out cursed. I'm also a bit put off by what I'm pretty sure is a touch of retconning regarding Winterson, his partner in Max Payne 2, although I suppose that could be just a bit of confusion over a somewhat ambiguous plot point. But it's more Max, it's free and it's really quite cool, so why not give it a look? Print editions of the book are on sale now [although I have no idea where], or you can read it online or snag the PDF at the Rockstar or Marvel websites. 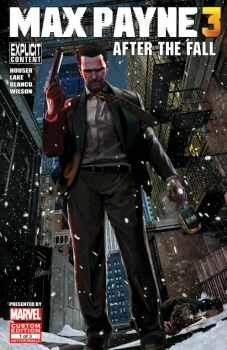 Max Payne 3 comes out on May 15 for the Xbox 360 and PlayStation 3, and May 29 for the PC.